WVI provides training and equipment for a turtle and terrapin rehabilitation centre that uses old Jacuzzis as holding facilities. Anyone spending time at the Banyan Tree Resort on the island of Mahé can now visit the Seychelles’ only Wildlife Conservation and Rehabilitation Centre, located in the hotel grounds. Hawksbill turtles nest on the nearby beach, while yellow bellied and black mud turtles (terrapins) live in the adjacent wetlands. All are Critically Endangered, and the new centre is playing a critical role in saving them from extinction. WVI has provided medical equipment and training to the Centre’s staff and local vets. Between site visits, WVI turtle experts provide advice remotely including via short videos; for example, how to make a tyre into the perfect surgical table for marine turtles. 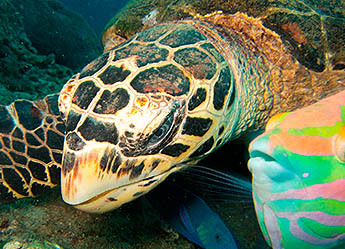 Please help WVI save the rare turtles and terrapins of the Indian Ocean. 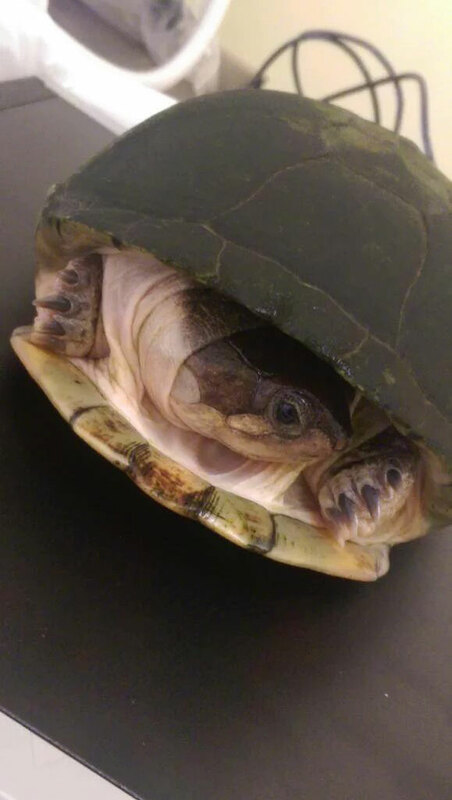 Read about one of the rescued turtles here. Boat propellers and unsuccessful poaching cause huge gashes in turtle’s shells and limbs. Development of mud flats makes mud turtles homeless. The Banyan Tree Resort on the island of Mahé in the Seychelles is in a unique position. Not only are its tropical surroundings idyllic, but Critically Endangered wildlife lives right on its doorstep. 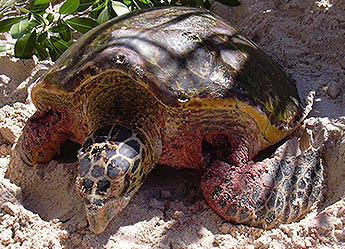 Hawksbill turtles nest on its beaches, while yellow-bellied and black mud turtles live in the nearby wetlands. Turtle numbers have suffered as a result of a general increase in human activity around their nesting areas, as well as historic poaching. Boating accidents are a particular threat, as animals floating near the surface can be easily injured or killed. Pollution and urbanisation are also having a direct affect on numbers. In response to this situation, the Banyan Tree Resort has made caring for the local habitat part of its Corporate Social Responsibility activities and is a key partner in a project run by the Marine Conservation Society, Seychelles (MCSS) and the Veterinary Division of the Seychelles Agricultural Agency, with WVI providing vital specialist support. As a result of this collaboration, the Seychelles’ only Wildlife Conservation and Rehabilitation Centre was formally opened in the grounds of the resort early in 2015. The islands have long lacked a facility for treating and rehabilitating injured wildlife, with a view to returning animals to the wild. The opening of the centre is therefore a very significant step forward. WVI’s Johanna Storm has made two visits to the centre so far, in order to train local vets and project staff. Training is tailored to the care and treatment of wildlife, with particular emphasis on turtles, tortoises, terrapins and birds. WVI also helped with the procurement of both an anaesthetic machine and, critically, a high quality X-ray machine, and Johanna has been able to provide training in their use. Since the hotel and MCSS began their work to monitor turtles in the area ten years ago, thousands of turtle eggs have been successfully hatched and many turtle nests protected. More recently, the nearby wetlands have been reclaimed as part of the overall project, with resort staff and children from the local Takamaka School helping to clean up the area, which is a perfect habitat for the endangered mud turtles. Now the marsh not only looks much better but is playing an important role in the ecosystem of the whole island. 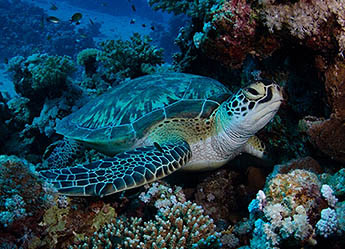 The Seychelles’ marine turtles and freshwater terrapins, including some critically endangered species, are threatened on all sides. Coastal areas are generally becoming more urbanised, with a significant rise in the dog population (both stray and owned), and an increase in pollution. This is leading to injury and death of turtles and terrapins at all stages of life. It is not unusual for reptiles and other animals to become entangled in, or be injured by, discarded fishing gear, or for them to eat rubbish, like plastic bags, which can prove fatal. Read Eden’s Story to learn more about what happened to one particular turtle. Although poaching of turtles in the local area on the island of Mahé is no longer a problem, the number of turtles who manage to nest successfully has continued to decline, due to disturbance from increased human activity close to their nest sites. Boating activities nearby are also a problem, as turtles resting near the surface are in real danger of injury or death. These factors, combined with the lack of wildlife and conservation expertise on the islands, mean the outlook for local endangered species, like the hawksbill turtle and the yellow-bellied and black mud turtles, is not good. This is where the Wildlife Conservation and Rehabilitation Centre has a vital role to play in treating and releasing sick and injured animals. Now that the Wildlife Conservation and Rehabilitation Centre is up and running, with WVI’s help, it is able to make a valuable contribution to local wildlife conservation. Recuperating turtles and terrapins in particular appreciate the tanks that have been created for them using upcycled jacuzzi tubs and kitchen sinks donated by the resort! In addition, a reconditioned kitchen table from the hotel is being used as an examination table in the clinic. WVI is providing specialist veterinary support to the centre’s staff on an ongoing basis. Specialist wildlife vet, Dr Johanna Storm, has visited in person twice, in order to train local staff from the Marine Conservation Society, Seychelles (MCSS), as well as both government and private vets. She has been able to examine the current inhabitants of the centre during her time there, and directly advise on their care and condition. WVI was able to help the centre get two major pieces of essential equipment at much reduced cost: a portable X-ray machine, with plates, lead gloves and apron, as well as a laptop with the appropriate software (with thanks to PLH Medical and Agfa Healthcare), and an anaesthetic machine (with thanks to General Anaesthetic Services). 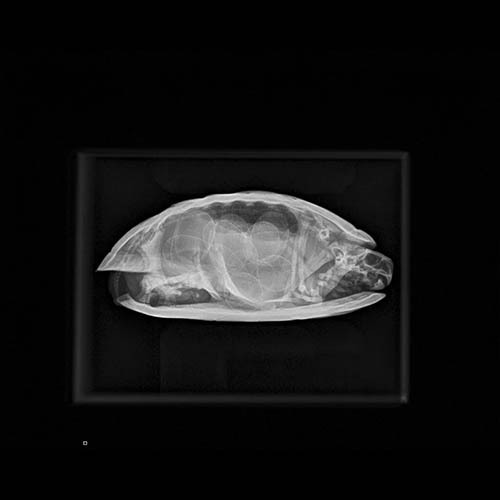 A good X-ray machine is particularly important for work with turtles and terrapins, where the presence of a shell can make examination and surgery particularly challenging. Johanna and Mark from PLH Medical have both been able to provide in situ training in their use and are always ready to give further advice from a distance as necessary. 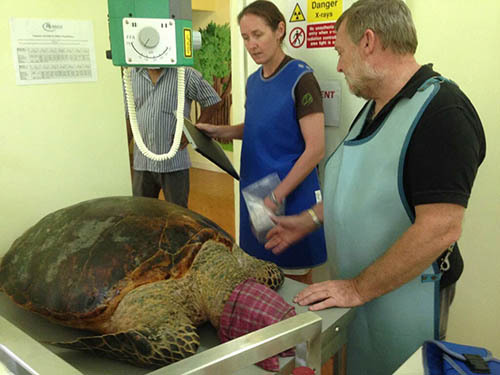 This is a big step forward for wildlife medicine in the Seychelles. In addition to the all important clinic, the centre acts as an education and information hub for interested hotel guests and local inhabitants, who can go there to learn about the biology and conservation of the local wildlife, and the environmental importance of the beach and wetlands. 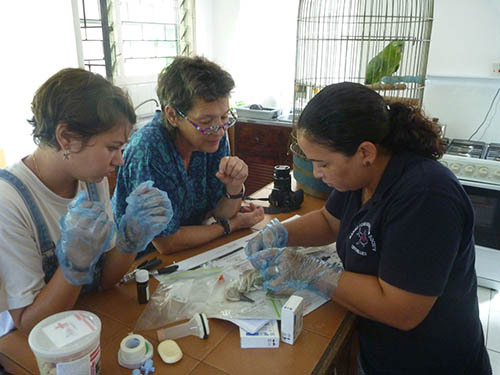 WVI is committed to increasing the wildlife medicine capacity of the Seychelles. This will take time and funds. However, getting an X-ray and anaesthetic machine installed in the Centre for Wildlife Conservation and Rehabilitation, as well as training local staff in their use, is a huge step forward. Looking to the future, WVI would like to see the Wildlife Conservation and Rehabilitation Centre become a centre for excellence, with further training of local vets, an increase in diagnostic capacity and a commitment to providing a service to the wider community. 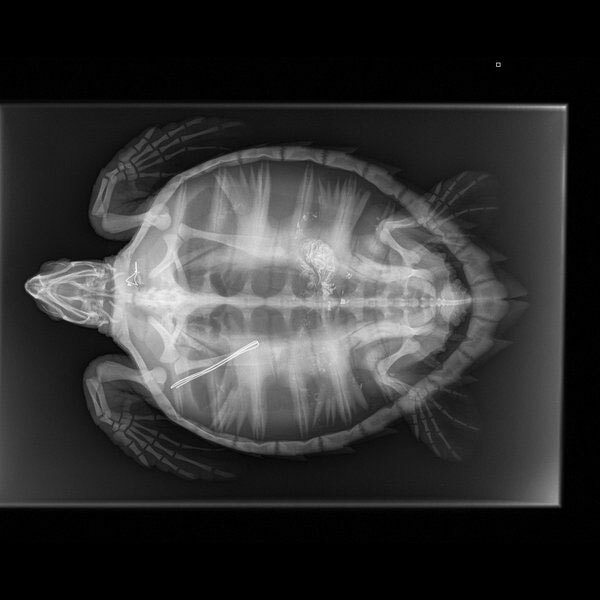 There is real potential for the portable X-ray machine to be used throughout the Seychelles, to help with diagnostics and treatment of wildlife and even domestic pets. In addition, and subject to discussions with the Seychelles Ministry of the Environment, there is a plan to set up a captive breeding programme for the yellow bellied mud turtle, which is found naturally nearby. There were believed to be only 90 of these turtles left worldwide in 2001, which led to its listing as Critically Endangered. This is an area in which WVI has considerable expertise and we look forward to being able to be a part of this exciting initiative.